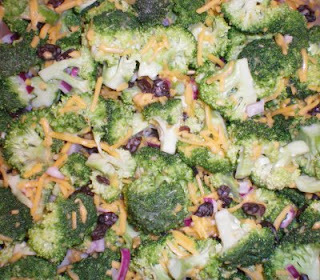 This is one of my favorite salads and I love to make it at home. Here's my version of this popular recipe and I hope you like it! Rinse and chop broccoli tops into bite sized flowerets and place in a large bowl. (Freeze stalks for soup recipes if desired.) Add chopped onion, raisins and cheddar cheese. In a separate bowl, mix together mayo, sugar and vinegar until blended well. Add to broccoli mixture and top with crumbled bacon if desired. Cover and store in fridge until ready to serve. Photo copyright by Michelle Jones and Blue Ridge Publishing, Inc.